What do you do when you only have an hour to make a dish to take over to a friend's house? Just kidding. Make Asian BBQ Shrimp like I did. I was looking forward to going over my friend Claudia's house all week. She lives on the water, and it's beautiful. It was also potluck, so I was thinking about what I could bring over. Thinking and doing are two different things however. I had work commitments on Wednesday, Thursday, and Friday nights, and thus no time to cook in advance. On Saturday, I also was at work in the morning until 2 pm. I had the wherewithal to take a 2 lb. bag of frozen large shrimp out of the freezer to defrost before I left for work, so when I got home at 3 pm, all I had to do was figure out what to do with them for the 4 pm party. I decided to make an Asian style marinade with pantry ingredients, including hoisin sauce (Chinese BBQ sauce), soy sauce, and Thai sweet chili sauce. A 15-minute soak in the flavorful marinade and a 2-3 minute sear on a hot skillet made these shrimp a snap to cook. While the shrimp was marinating, I made a quick Asian slaw out of shredded Napa cabbage, red cabbage, and carrots, which I dressed very lightly with a dressing of rice vinegar, sesame oil, honey, and Thai sweet chili sauce. I used the slaw as a bed for the grilled shrimp. Everyone seemed to enjoy the shrimp, which were fine at room temperature, and ate it as a salad. If people chose, they could also take a piece of shrimp from the platter without the slaw and just eat it as a finger food. Fast. Flavorful. Festive. I would say this dish is BBB-worthy, wouldn't you? Mix together marinade ingredients. Rinse shrimp in a strainer of any ice residue and put in a bowl. 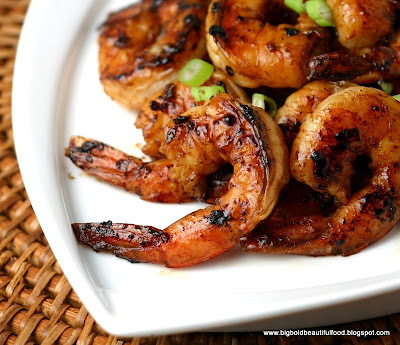 Mix the shrimp with marinade and let marinate 15-30 minutes. Serve hot, room temperature, or cold, as an appetizer or main dish. Mix together dressing ingredients and adjust seasonings, making it sweeter, saltier, or more tangy as you prefer. Mix together slaw ingredients and lightly dress with dressing. If there's a lot of dressing, strain the extra dressing out, so the slaw stays crisp. Oh Yes Ninette - It definitely looks like a great BBQ dish. How much of hoisin, soy and sweet chili did you put - was it equal proportion? Thanks! Hey Trissa, the amounts I used are in the recipe at the end of the post. I really like this quick, easy and delicious dish. 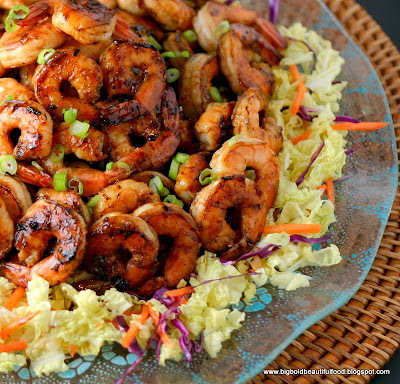 I've tried a similar teriyaki grilled shrimp, but I've never had the Asian slaw before. I'll have to try that out. Thanks. Oh I love this Ninette. Very healthy and perfect for a quick dinner too!! I'm going to be making this soon for sure. What a nice dish to bring to a potluck too! I love this kind of dish too and I have to tell you that your Saveur crest looks perfect for you!Congratulations! Its so hard to go wrong with shrimp, and then shrimp on the Barbie.....yummy! I love shrimp. This IS the perfect dish, great finger food :) I'm sure the spicy kick with chili sauce brings out the flavors beautifully. Ahhh...lovely. Sometimes the simplest things can be the best. It looks wonderful and I bet it tastes even better! Quick thinking on your part, results= a colorful, fresh dish that everyone will enjoy. Keeping prepared sauces that need only a little "doctoring", and frozen shrimp in the freezer help pull this recipe together in a flash! What a perfect summer dish! well done! Hello can you link my site to your site ?